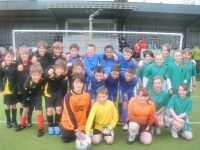 New Directions Football Tournament – First Teams Through to the Football Final. Coed Glas Primary School, Cardiff. Ysgol Gynradd Gymraeg Cwm Garw, Bridgend. After a very sucessful first day New Directions wish to congratulate the Boys teams from Newton primary school, Swansea and Coed Glas primary school, Cardiff, and the Girls team from Ysgol Gynradd Gymraeg Cwm Garw, Bridgend. After some amazing football they all made it through to the final of the primary schools football tournament on the 29th of March. Well done to everyone who took part the standard of football was fantastic all round.